We at the Wheel remember our freshman years, when former U.S. President Jimmy Carter spoke to us at his Town Hall. Some of us were still adjusting to life away from home and none of us knew quite what to expect. But no matter the year, when Carter stood up to speak, he smiled, and with that, made us remember the care of a grandfather. Over the past 33 years, Carter has maintained a relationship with Emory University that is unparalleled by any other between a former U.S. president and an educational institution. Last Wednesday, he answered questions asked by the freshman class for the 34th time. Given his recent cancer diagnosis, the Wheel would like to take this opportunity to thank Carter. In 1982, Carter joined the Emory faculty as a distinguished professor, teaching two classes a month for more than 10 years, both in the Goizueta Business School and across College. That same year, Carter and his wife Rosalynn created the Carter Center, a policy research institute; its aim was to improve health, resolve conflicts and spread democracy across the world. Former University President James T. Laney agreed to partner Emory with the Center, housing it on the top floor of the Robert W. Woodruff Library until 1986, when it was moved to its current location. Since the Carter Center’s founding, it has provided opportunities for Emory faculty to apply their studies to real world issues. Among them, former Emory political science professor Richard Joseph directed the Center’s African Governance Program from 1988 to 1994. Moreover, the Center has given Emory students opportunities to have roles in projects they would not have access to otherwise. Each year, the Center’s internship program, which is ranked one of the best in the country by The Princeton Review, takes more students and recent graduates from Emory than anywhere else. Half of the members of the Center’s Board of Trustees are appointed by Emory — Carter has made it a point to make the Center and its accomplishments as much a part of Emory’s legacy as his own. 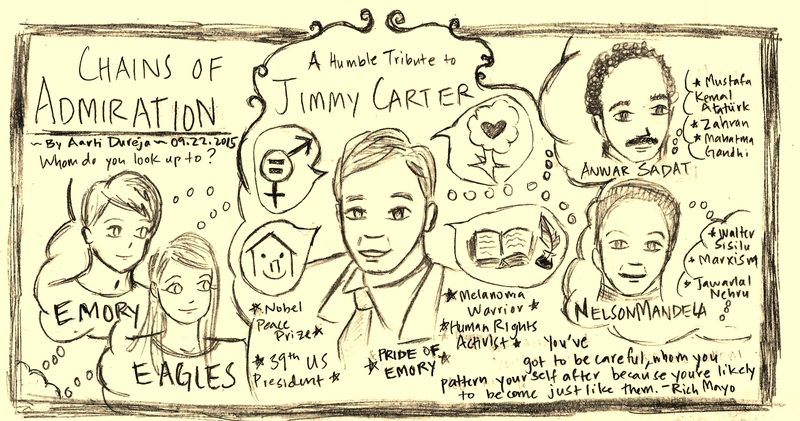 Carter has, by our observations, truly cared about not only our university, but also about the individuals within it. He has been gracious enough to be accessible to the Wheel. He has tried to make Emory, Atlanta and the world better. And for those things, President Carter, we thank you.